Los Angeles’ representation in film as apocalypse and paradise complicates the wildfire response. Los Angeles Often Burns in the Movies. Now It’s Burning in Real Life. Those cinematic associations complicate the conversation around Southern California’s wildfires. 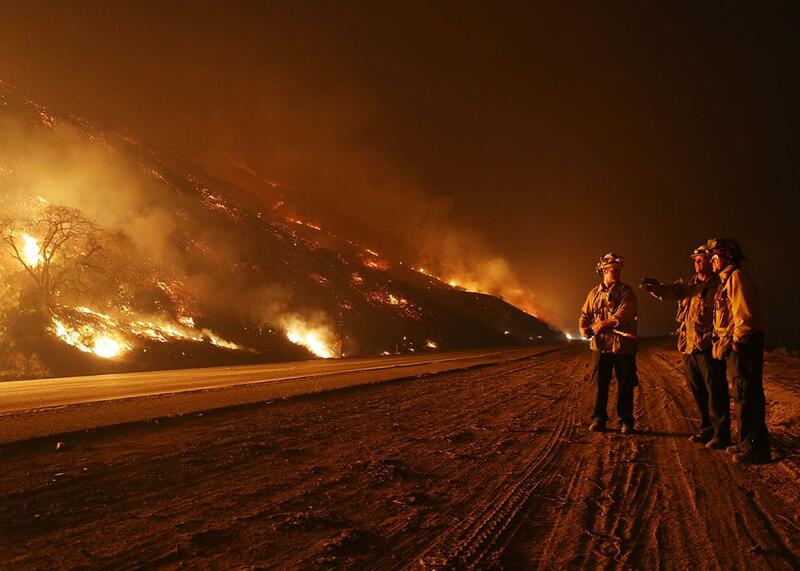 Firefighters monitor a section of the Thomas Fire along the 101 freeway on Thursday north of Ventura, California. This story was originally published by CityLab and has been republished here with permission from Climate Desk. You’ve seen Los Angeles burning in the movies. But a video shot from a car on the Interstate 405 early Wednesday morning was as apocalyptic a view of my city as in any disaster film. Along the dry edge of the Sepulveda Pass, where the country’s busiest freeway bridges the Santa Monica Mountains, a brush fire is roiling acres of houses, museums, and religious centers. Thousands have evacuated; many structures are already in flames. A few miles downhill, in the San Fernando Valley, soot is dusting my childhood home. Dubbed the Skirball Fire, this is the fourth major blaze in the greater L.A. area this week; it arrives two months after fires in Northern California wine country claimed 44 lives and $3 billion in property damage. Now, ferocious flames in Southern California’s Santa Clarita, Sylmar, and Ventura areas are destroying homes and driving out thousands of residents; they will rage for days to come. Drought and record-breaking heat, driven by a changing climate, are making both ends of the state more fire-prone. It’s been months since L.A.’s hills have had a good soak. But the main culprit of these fires is the Santa Ana winds—powerful, withering gusts of air that lash down from the high desert to the coast nearly every autumn. They turn embers into high-intensity blazes notoriously difficult to battle. This year, surface temperature changes in the Pacific have created a pressure gradient especially conducive to the winds. Southern California experienced twice as many Santa Ana days as usual in October; December typically brings 10 such days, and by the end of this week, the region will have already had six. And Los Angeles is burning"
Some viewers will find it hard to separate the freeway footage of the Skirball Fire, and the multimillion dollar homes it is burning to the ground (including, yes, Rupert Murdoch’s), from these strong cinematic associations. For those in East Coast cities in particular, perhaps, it will stir up a certain moralism about where cities should and should not be—reminiscent, perhaps, of how hurricane damage was often characterized as karma for overdevelopment in Florida and Texas. Why were people living there to begin with? Undoubtedly, California’s fires have lessons for urban planners: Some of the foothill communities burning this week have recently developed further into the wild-land interface, inserting homes into fire-prone areas. Zoning and other land-use policies may need to be re-examined, among other ways leaders must prepare for and mitigate the effects of an always-burning future, as the warming atmosphere fans Santa Ana flames. But today, as the world watches Los Angeles burn, the view is not only familiar from the movies. Every city is now examining itself in the face of climate change and its companion threats of sea-level rise, devastating storms, and extreme heat. Where should we be building and rebuilding? Who gets to live here, and how should we live? These are no longer questions that haunt only residents of L.A., where a rapprochement with catastrophe has long been part of the civic contract. New York, Boston, D.C., and the rest are looking at themselves in the mirror, too; in a sense, all cities are defying nature now. Once despised by so many urbanists for its “uncultured,” car-centric sprawl, L.A. has become an unlikely leader in this dialogue, with ambitious plans to transform its transportation networks, densify the city, and reduce climate impacts. Los Angeles is burning, but now there is a Devil Wind blowing around the world. The hubris, and the responsibility to act, is everyone’s to share.